Brownfield ASP.Net Web Forms Migrations – Tommy Long – Musings of an angry developer. I recently started work for a new (and very exciting) company. Like many of my previous roles, this one entails a good mix of Brownfield and Greenfield development. I’ve met and worked with some great developers who would outright refuse roles that held too much Brownfield work, preferring pastures green, as well as working with some great devs that prefer the challenge of Brownfield. Having worked with the key .Net web technologies, I’d like to put to paper and potentially pass on, by way of this article, some insights into Brownfield development (plus invite comment on further insights and improvements on these techniques). My past few roles have entailed a large amount of what we’ll fondly refer to as heritage software. Whenever tackling these code bases, my first task towards orchestrating the migration or uplifting of heritage software is establishing the estate. 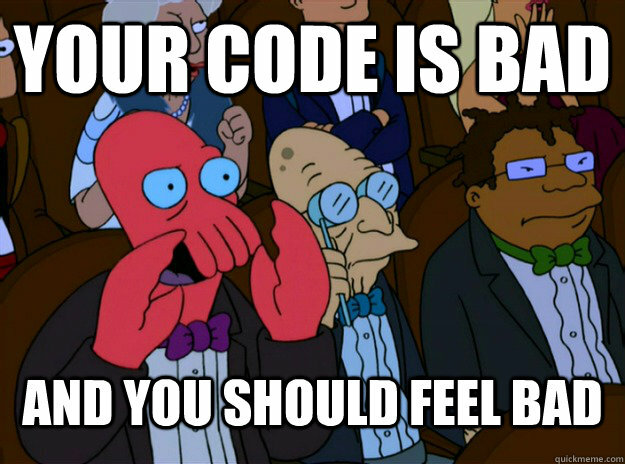 Most of the legacy code I’ve inherited throughout my career was being maintained by developers that were not around for the entire history of the software. Oftentimes you’ll be working with developers long since devoid of the original authors and left with little more than speculation and grey area, but your number one job is to understand the functionality of the software suite. I don’t aim to know how it works, and as amusing or aggravating as the why-it-works-that-way might be, that isn’t necessarily of importance either. Those that know me well probably wouldn’t use the word “tact” in the same sentence as my name. Bad code really gripes me and it’s not uncommon for my mouth to move before my brain catches up. In closed company this can be a great stress relief, and I’ve no problem with anonymous/redacted submissions to The Daily WTF, but putting people’s backs up doesn’t help. Having hurt several people’s feelings in the past saying the first angry thing that came to mind after seeing a snippet of… interesting code, I’ve had to lay some ground rules for myself that others may benefit from. Presume that the bizarre and downright crazy code you come across was driven by one reason or another that you simply can’t comprehend, and the inability to comprehend it is your shortcoming. Accept that decisions were made with constraints you can’t fathom, and there’s little that whining about it will do to change a thing. …but in all likelihood, the developers who wrote the software didn’t hear that advice. There are only two real ways I’ve found to establish an estate. The first and most preferable is through the experience of others. Asking questions starting at high level design, digging down as necessary, but making an effort not to point fingers. If the people answering my questions are not aware how bad (I think) their code is, I’d rather teach them by example; through excited demonstrations of good software at a later date, not by shaming them in the present. Alongside gaining information from peers that may have been around longer than me, or in the complete absence of such, I also dig through code. Of course, the first thing I do is go looking for an up to date and comprehensive test suite… one day that might even pan out for me. More likely though, you’ll jump to a test project to find empty, redundant, commented-out, superfluous blocks of code. My preferred approach when I don’t have tests is to establish the public endpoints. What is the customer facing surface area of the product? What are the common interactions? How does the code accomplish these tasks? What services, API calls, database logic and so forth is required to achieve the most basic and most common aspects? I don’t try to memorise and graph everything; take notes and update any documentation that proved to be incorrect, but at this stage you just need to get a feel for how the thing hangs together. You might think that this section should have come earlier. But actually, the establishing of one’s estate is something I’d begin on day 1 of any role, regardless of overarching objectives. I’m not sure if we’re seeing a shift in the industry or if I’ve just been lucky, but my last several CTO’s/managers valued intelligent, self-managing autonomous teams. They provided high level goals and appropriate deadlines with little else, preferring that the team determine the best courses of action. If your managers aren’t quite as cool though, there’s still some tips below, especially in the Bottom-Up Section. Note: I’ve noticed that I don’t always agree with which way round “top-down” and “bottom-up” describes these mechanisms. I’ll describe them as I visualise them in my head, but be aware I (or others) may use the inverse! Knowing what the product does, having established the estate, albeit not including all the nuances and finer detail, how would I write the product from scratch? As a team, draft and design, at a high level, what that system would look like. What tech stacks would you be looking at, what architecture, what deployment infrastructure, security, resilience, and so forth, would be built in? This ideal system, subject to change as requirements are deduced and refined, is now my goal. The question becomes, how do you iteratively arrive at that goal. In the past I’ve worked for a couple of companies that had decided that the only way to migrate their product, was a complete re-write. At the time, this meant more interesting code writing for me, so who was I to complain. However, one company was writing a new web product in parallel with maintenance on a thick WinForms product. I don’t know if they ever got there, but I had the distinct impression that there was simply no way for the new product to catch up with the old. Another company I worked for had been through THREE attempts to re-write their software. Each had ended when cash or motivation for the cycle ran dry and the re-write was scrapped in favour of the much more stable and feature-full original legacy software. By the time I joined said company, they had bought all of their users a second monitor so that everyone could run new and old systems at the same time - entering data into both systems for every operation. The point being, if your plan is to File -> New Solution and one day flick a switch, chances are you’re doomed to failure. I’ve heard in passing from proud CTO’s where such an endeavour has paid off, but it is a massive and unnecessary gamble. By and large, all you’ll achieve is the creation of an incomplete product fork that is shelved when the cash runs out, or is forced into the wilderness despite reduced and unfinished functionality, causing your users no end of pain. Therefore, the trick becomes, how do you get from A → B. I try to define phases, often utilising one of the techniques below as a starting point, then iteratively adding my ideal infrastructure in phases that get me from the current code base to the end goal. Whilst that’s quite an abstract description of this process, each system will need to be assessed on a case by case basis. Especially when using the proxy technique described later in this article, it’s quite often possible to roll over to new infrastructure at the speed a DNS change propagates without incurring any downtime at all. In the case of upgrades to necessitate sideloading however, the best bet is often to coincide changes with a scheduled release. Along every step of the way, I try to improve the logs and analytics available to me. I know that speculation and even educated guesswork is still exactly that, guesswork. As heritage components are exchanged out, I do what I can to accommodate existing users. Legacy API surfaces typically don’t have any versioning mechanisms so treat your existing estate as v1 implicitly, and build v2 upon it, using metrics and logs to determine when aspects of the heritage system can safely be disabled and removed. As components are deprecated and replaced, it’s important to remember to go back and delete the respective code. Many a time I’ve stumbled across orphaned code but lacking the context that the functionality was recently replaced, the decision to remove the code is much trickier! I’ve worked for several companies where terms like “migration” and “re-write” were too big and scary to be even uttered. Companies where product owners, line management, top bods, or all of the above were against the idea of improving the software for one reason or another. Sometimes it’s worth fighting with them over it; perhaps it’s just a fear of the unknown which can be alleviated, or a misunderstanding of what’s involved. But when all else fails, I always fall back on the bottom-up approach. For those familiar with the boyscout rule, the bottom-up migration is little more than a slight extension of that. More often than not, I’ve found it’s just about drawing lines a little further in the sand. I’ve often found that these roles follow Panic-Driven-Development (PDD), placing themselves in an endless vicious cycle of fire fighting the latest problem as quickly as possible, foregoing clean coding principles. Many a time I’ve seen this equally-endlessly described as a temporary measure, but of course, foregoing good practices in code inevitably leading to more fires to that need putting out, increasing code complexity from hack after hack further slowing down the ability to maintain the software. The way out of this loop, I’ve found, is to move the line in the sand. Step up your boy-scouting from removing unused variables and correcting member casing, to writing tests. Using one of the testing practices explained below, I’m often able to get dependency injection and mocking into even the worst of code bases. Once you’ve established a testing practice (remembering to onboard and help peers to do the same), step it up to the next level. Keep improving upon the worst areas, driven by customer demand typically, though evaluation of technical debt where time permits. With this approach, I find you end up in a hybrid state for longer than is the case with top-down, but if your focus is on addressing problem areas, presumably any lingering legacy code isn’t causing you a great deal of harm. In that respect, this approach, while not my preference, can be more palatable to stakeholders. Better yet, you don’t need any permission or sign-off. …I only offer them estimates based on my line in the sand. I’ve found there needs to be a pragmatic vs. dogmatic balance mind you. If you leave your product owner or stakeholders in a bind, you may be doing more harm than good to your company, no matter your intentions. More often than not there’s a middle ground that both sides can compromise and agree upon, though try not to be pushed too far back from that mythical line in the sand. I’ve usually found this to be an arduous and lengthy process, but as confidence in the software increases due to a reducing number of bugs, confidence in the development team increases alongside it. If the doors were closed on a top-down approach before, you may find them increasingly ajar as confidence improves. Having established the estate, determined a preferred migration methodology, and put together some flexible high level phases that will get us to our goal, the really tough part begins. How to get there? I’m going to list a few titbits I’ve picked up over the years, including code samples, where applicable, that may help you achieve your ends. These particular code samples will be focused on the web stack, but I’ve had experience with WinForms, WPF, UWP (desktop based) technologies so if you’d like some advice there, ping me a comment and I’ll draft up some notes. If you have something specific in mind, feel free to jump to the section below that best describes where you are right now. If there is an IIS version that can side load both the ASP Classic site(s) and a .Net site, I’ll attempt to follow the Proxy section below. If the site(s) are addressed by DNS instead of by IP directly, I can still try the Proxy methodology. If the site is addressed directly, and/or the site relies on some crazy old undocumented and unsupported dll, inevitably I’ve ended up having to replace some components en masse. However, still check out the Testing sections below for some advice on how to do so more safely. As a technology, I consider ASP .Net Web Forms to be worse than ASP Classic. The bastardisation of HTTP to better suit desktop minded developers, whilst a viable developer migration strategy for Microsoft, was in all other respects a mistake. ASP Classic is at least not all that different from “modern” scripting languages such as PHP, which whilst I might not have any fondness for either, still have their uses. I recommend checking out existing articles such as Rachel Appel’s guide or check out my own advice in the WebForms to MVC section below for a guide on sideloading Web Forms and MVC. This allows the introduction of MVC mechanisms into an existing web application. Once the infrastructure is in place, I make it a rule that all new work should be completed using the MVC architecture, and whenever a significant amount of work is required within an existing Web Form, I consider moving the code to MVC instead (bearing in mind aforementioned pragmatic/dogmatic caveat). I’m not going to argue or even make a case for the merits of migrating from WebForms to MVC; I’d just end up ranting. Apart from my deepfelt resentment for the WebForms stack, the benefits of MVC over Web Forms are very easy to google for. Once MVC side loading is in place, check out the Testing section below for tips on how to more safely migrate heritage code. I’ve been working with the .Net Core stack since it was still called “Project K” (so, a few years now). Whilst I’m more inclined to harp on about why and exactly how .Net Core is better, I’ll try not to. However, I do consider it a huge improvement over class/full-fat MVC (let alone Web Forms), and recommend it to others. If you check out the section below on Full-Fat .Net Core, you may find it’s easier to get into than you imagined. There are two key techniques I use and recommend to others when it comes to migrating a code base. They each have their own pros & cons, and the best choice will be determined by your circumstances. All techniques assume you’re using some kind of version control and if everything goes wrong, you can just back out and start over. If you’re not using version control and mess things up, I’ll lose no sleep over your lack of forethought. This involves running both old and new technology stacks in the same application. It won’t apply to ASP Classic, but for later technologies, check out the following sections for examples on how to do this. There are already some great guides out there on how to sideload so I won’t provide all the details here, they haven’t really changed that much between the MVC versions. It’s important to note that this is a migration to the “full fat” ASP .Net framework and has nothing at all to do with .Net Core. There are two ways to perform the migration as detailed below. Neither is necessarily better, but if you find yourself stuck trying one option, simply shelve/revert your changes and try the other option. Regardless which option you go with, you’ll need to ensure your Web Forms application is targeting a supported version of .Net. Note: If you’re still targeting .Net 4.5.1 or lower, you’re using an unsupported .Net version, so get yourself updated. These infrastructural changes can be a nightmare to test if you don’t have a reliable test suite. There is no silver bullet if you don’t have tests; you’re going to need to set yourself up a replica of your Production server and make sure the upgraded version performs as expected the hard way (manual testing). For what it’s worth, whilst I have encountered issues post-migration, they’ve always been immediately obvious (errors on startup) and easy to google a resolution to. It’ll be tedious, but if your google-foo is strong, rarely more than a day or two of effort at least getting everything up and running. In this approach, we’ll create a new MVC 5 project and move our existing code over. Open one of the code files in the Web Forms project (doesn’t matter which). Add a random (valid, but unused) using statement (unless there are already greyed out using statements present). This will come in very useful later if you haven’t been cleaning up your usings before now. Caveat: Visual Studio can be a little cavalier when determining whether a using is in use or not. Especially if you have any imports inside aspx/asmx/ascx files. Make sure you review your changes, that your project still builds, and that your views still render. Typically, opening any file modified will cause static analysis to kick in - if it starts showing exceptions, then add the necessary imports back. Create a new MVC 5 Project. Navigate to your Web Forms project in Windows Explorer, and copy all of the files (and folders) to your New Project, except those listed below. If prompted, skip any files about replacements and take note of which files couldn’t be copied. If you expand your MVC project, in addition to the default MVC infrastructure generated during project creation, you should be able to see all your pages, controls, and so forth, copied over from the Web Forms project. You need to work through all these files, R-Click them and choose Include in Project. You can highlight several at a time and include whole folders to make it easier. This should be no different to any other code merge. MVC 5 will only be using the Application_Start event currently, so copy over any custom code you have in the old global.asax being careful not to remove the MVC 5 logic. This is much trickier because there will often be a considerable difference between the configs. You’ll need to not only copy over the obvious items like appSettings and connectionStrings, but also ensure required HttpModules, security and runtime settings, WCF bindings, and anything else your Web Forms project actually needed is copied over. If you start with the basics, you can then just keep trying to load your new site, resolving startup errors by copying over the respective old configuration (you may need to come back to this task after you’ve got the new project compiling). Merge over all the files you took note of in Step 6. Try to build your new MVC project. The likelihood is that it will fail because references included in your old project have not yet been added to the MVC project. Run a build and then examine your Error List, ensuring that you’ve selected Build Only in the drop down (Intellisense can generate thousands of errors when a reference is missing, creating a lot of confusing noise). The errors you find will almost always be a difference in references between old and new projects. In the file with an exception, take a look at what Visual Studio thinks is an unused or missing using statement (which we know shouldn’t exist now because we removed them all earlier) at the top of the file, and add a reference to the respective assembly. The name of the using should give a good indication as to which assembly you’re missing, otherwise lookup one of the classes that cannot be resolved on MSDN; the page will tell you exactly which assembly contains the given class. Any errors you can’t fix by adding a reference to the necessary assembly, take to google. Make sure your views actually compile. Either open each of the views to see what intellisense finds, or publish the site with Precompilation enabled to ensure the views haven’t been broken. For whatever reason, the static analysis that identifies problems in your *.cs files doesn’t scan your views so this form of precompilation can be useful to locate errors that static analysis misses and would otherwise cause you a runtime exception. Congratulations, with a little bit of luck you’ve now got your project sideloading. Feel free to drop me a comment if you get stuck and can’t find an answer on google. 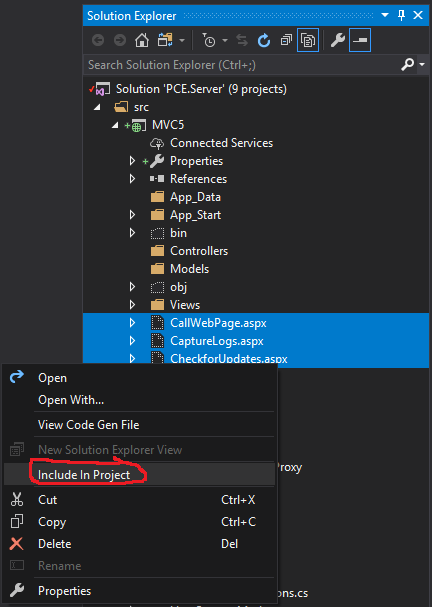 Next steps, you can either look at the Testing section for advice on how to replace those pesky Web Forms files, or if you’ve managed to achieve that, check out the section below on migrating to .Net core. With this approach, we’ll try to uplift an existing Web Forms project to include the necessary MVC 5 infrastructure. 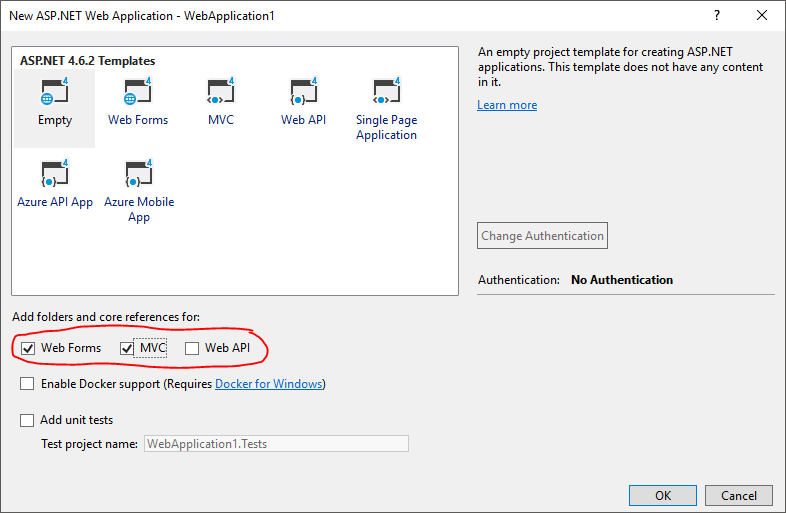 Before you start, I recommend creating a new (temporary) MVC 5 web application that has both Web Forms and MVC enabled so that you have an easy-to-reach example project to check if you’re unsure about something. All being well, you should now have enabled MVC in your Web Forms project. To test everything is working, try Adding a Controller and confirming you get a result. ..but that probably doesn’t make a great deal of sense. I don’t really want to get into explaining the difference between platforms or what exactly .Net Standard is, so I recommend having a scan of this article if you’re unsure. The point being, when people talk about “Full Fat .Net Core” what they’re actually talking about is using the latest tooling such as the improved csproj format and not the cross-platform features introduced by .Net Core itself. In addition to a cleaner csproj, you also get features like the transitive dependency mechanism. When something is referenced, everything it references in turn is also pulled in, so instead of a package.config (which is no longer necessary) filled with dozens of packages despite you only having added 1 top-level package, you need only list the top level now. .Net Core has a much higher release cadence than .Net Framework, so the associated tooling evolves quicker; it’s likely worth your time migrating to .Net Core. You’ll be rewarded with improved tooling, and you needn’t change anything on your production server / deployment targets. Plus, it’ll place you in a better position to migrate to the .Net Core platform should it’s feature set entice you. If sideloading isn’t for you, there is an alternative. The idea here is to create a new web application which completely replaces your old website, but, by default, forwards all the requests to your old site (which is deployed elsewhere, in turn). This of course introduces an additional web call and the associated latency which can be a deal breaker for many. But, if old and new site are physically co-located or sat in the same Cloud virtual network, you’ll be surprised how small that latency is. What you get in return for this latency is the ability to conditionally handle any request originally intended for your old site whilst using a new and improved technology stack, safe in the knowledge that anything you haven’t decided to replace is being executed the way it used to. Better still, Microsoft have already started writing the code necessary to do this very simply. In my opinion, better to use the existing code with no expectation of support, pushing useful changes back and testing the middleware for Microsoft than to write something homebrew. I’m going to assume that you’re using Git and the new site you’re introducing is .Net Core (running on full fat if need be) because why wouldn’t you? (Sure, because you want a mature EF, working SignalR, some other un-migrated dependency; all legit reasons). If you need to target .Net Framework, open the csproj and change the value of <TargetFramework> (i.e. 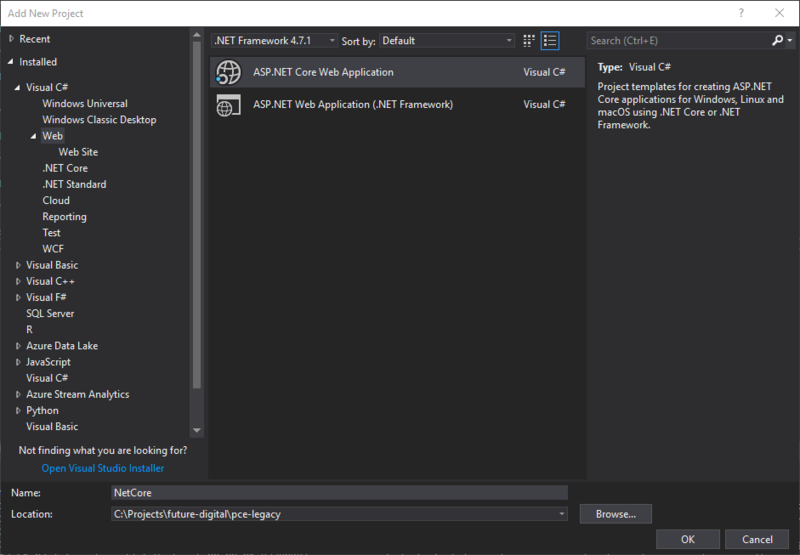 net462 for .Net Framework v4.6.2). Note: Please don’t jump through all the above hoops if Microsoft have gotten round to publishing this package since I wrote this article. Be sure to check here for a version greater than 0.2.0, at which point skip steps 2-11 and just add the NuGet package instead. Unfortunately, both the MVC and Proxy middleware are pipeline branch terminators which means that MVC will always handle a request and not pass it on to any middleware registered after the MVC registration (even when MVC doesn’t know how to handle it). And as you might imagine, there is no request the Proxy wouldn’t know how to handle because all it’s doing is forwarding requests to the configured endpoint, so again, it won’t pass a request on to the next piece of middleware. If you want to use MVC in your new site you’ll need to map specific requests to either the proxy or MVC (depending which way round you prefer / is easier). So you’ve decided which migration technique to use, be it sideloading or via proxy, and now you’re ready to start replacing some of your old code? As I’ve said before in this article, there is no easy answer. However, I would like to show you the multi-targeting power of .Net Core tooling which may allow you to safely replace existing pages. Before we can do that though, you’re almost definitely going to need dependency injection (DI) in order to mock aspects of your environment and execution pipeline. If you need to inject *.aspx pages, it’s a real palaver (one of the many benefits of moving to MVC is improved abstraction). There are only two mechanisms I know of for Web Forms described in the sections below. The reason you can’t easily implement DI in Web Forms is that the factories that are responsible for receiving a request and building up an instance of your Page to pass the request to, insist upon there being a parameterless public constructor on the page. If there can be no parameters, there can be no (constructor) injection. You could circumvent this using the Service Locator Anti-Pattern, but you should not. There are other workarounds (such as those listed here) that take very little time to put together and at least don’t fragment your composition. One way of working around this is defining two constructors in your pages. The first, public parameterless (implicitly apparent when none are defined) and the second containing your dependencies. There is a good article on MSDN showing how you can then use an IHttpModule to hook your choice of container into the PreRequestHandlerExecute allowing you to take actions against the page being called prior to your page life cycle. I personally really like the new Microsoft.Extensions.DependencyInjection libraries so the following code shows an alternate version of the aforementioned MSDN article using the Microsoft library instead of Autofac. This IHttpModule uses a greedy search to find the largest constructor on the Page you’re trying to instantiate, and then attempt to populate the parameters using the Microsoft Dependency Injection container. We can’t just ask the DI container to create the page itself because the Page will already have been created by the hidden away WebForms framework (the one that required there be a public parameterless constructor present), and in case you didn’t know, you don’t have to use the new keyword to call a constructor; it is just a method at the end of the day. As a slight aside, many full DI container libraries implement an improved version of this greedy search in that they will attempt to find the largest constructor they have sufficient service bindings to actually fulfil. You’re welcome to expand the above snippet if you need that functionality (or ping me a comment below if you’re unsure how), but it should be fairly trivial to utilise the IServiceCollection to determine which constructors can and can not be fulfilled. Make sure you replace Your.Namespace and Your.AssemblyName. Property Injection is very similar to the constructor injection shown above. Instead of writing your own constructor to populate fields as shown above, your composition framework (be it imported or homebrew) becomes responsible for locating Properties on the page that need to be populated, and then populates them. Generally, I really dislike this approach. By having dependencies passed to a constructor it’s very obvious that the class requires those dependencies in order to function (to the point that you can’t instantiate it without them). With properties however, it’s akin some very old (bad) practices that involved having to call Initialise or Init on a class before the class is available for use. In my experience, it also leads to any dependency validation (null checking for example) being duplicated across the class, and there’s unless you add validation to the properties, implies that a user can modify your dependency properties (more null checking, concurrency issues, etc). However, when all is said and done, property injection is the preferred approach when working with Web Forms purely because it looks a little cleaner. A good number of DI Containers such as StructureMap and SimpleInjector can handle this property injection out of the box and be integrated into WebForms easily.